Build your cabin or dream home here! Beautiful-level wood lot with a good mix of mature and young trees gently sloping to the waters edge. This is a secluded peaceful location on a dead-end road yet only minutes to town. Lot would be perfect for a walkout basement. This a hard to find lot that does not come up often! Take a look today! Wooded, level lot gently sloping to Tilden Mill Pond with 153` of low bank frontage to enjoy! Sit by the fire, fish or just enjoy the view and serenity on this property! Located on a dead end road yet minutes from Highway or town. This is an exceptional lot. Schedule your showing today! 11.9 acres centrally located between Claire , Chippewa Falls And Menomonie and minutes to Hwy 29. building potential for a walkout with sloping landscape and plenty of options with the varied terrain. Many possibilities with availability of up-to 4 residential lots. Great country views, easy Hwy access. Come take a look! 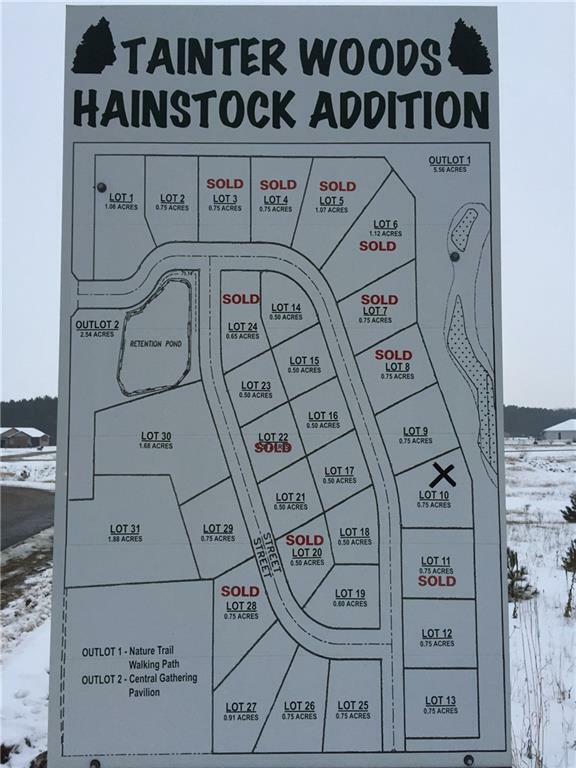 Ideal location to build your new home on this level 1.85 ac double lot located on 2nd St. Most utilities located at the street, ATV Trials runs past property, close to everything with lots of options. Campers can be parked on the lots with some limitations. Manufactured and mobile homes may be allowed. Take a look today! Campers have option to hook up to city services if Desired. Nice lot in a growing subdivision. Minutes to Menomonie or I-94. Several lots left to choose from, get yours today!